Four-year-old Emmett Anderson of Stockholm is clearly a fan of the Top o’ Maine Trade Show. MADAWASKA, Maine — Four-year-old Emmett Anderson of Stockholm is clearly a fan of the Top o’ Maine Trade Show. 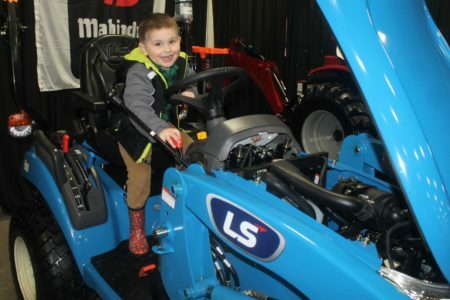 With his parents in tow, the young boy zoomed from recreational vehicles to tractors on display at the event, which the St. John Valley hosted at the Madawaska Multi-Purpose Center on Saturday, April 22 and Sunday, April 23. “We like coming to the Madawaska Trade Show,” said Emmett’s mother, Alicia Anderson. While Emmett confidently climbed onto the seat of a 25 horsepower LS tractor and pretended to shift gears on Saturday, Alicia explained her son’s enthusiasm. Roger’s Sport Center of Fort Kent displayed the LS, which has a built in lawnmower, along with several models of recreational vehicles the business sells, including a four-wheeler and wave runner. This year marked the Trade Show’s 28th year. Seventy-three exhibitors rented 117 booths at the event, which saw 1,775 people come through the doors of the Multi-Purpose Center, according to St. John Valley Chamber of Commerce Executive Director Brian Bouley. 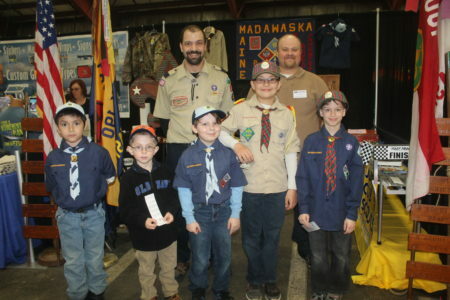 Exhibitors ranged from local businesses such as Marquis Treeworks, St. John Valley Sound Express and Norstate Federal Credit Union, to public service groups like The Heather and Liam Connection and Boy Scout Pack 190. The Pride of Madawaska band, Valley Mustangs football team, the Maine Agri-Women and KTC’s Brain Freeze peddled food and beverages at the event. 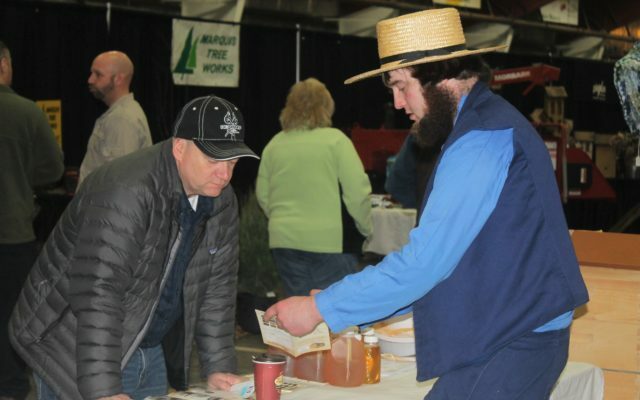 Members of a 32-family Amish Community based in Easton, Sam Miller, Enos Yoder and Jonas Swartzentruber represented several of their businesses at the Trade Show. Aroostook Bee Supply sells beginner kits and complete beehives and E-N-R Stainless offers 24 gauge pipes, chimney caps and roof flanges. This is the group’s third year participating in the Trade Show. “There is no other business like us,” Miller added. And business is what the Trade Show is all about, for the most part, according to Bouley. The Chamber will use funds raised from the Trade Show to pay for operational expenses. “It’s a major part of our budget for the year. Without this event, I don’t think we could survive,” Bouley said. WAGM sponsored a $500 Trade Show door prize. According to Bouley, Dead River Company provided thousands of dollars worth of free fuel to warm the Multi-Purpose Center, which houses the Madawaska ice skating rink during the winter months.